Malaysia Airlines flight MH370 carrying 239 people crashed into the sea, reports Vietnamese state media citing a Navy official. The craft disappeared from radars early on Saturday morning over Vietnamese airspace. Vietnamese Air Force planes have spotted two oil slicks which they suspect may have come from the missing airplane, AP reported. The Air Force said the slicks were discovered off the southern tip of Vietnam and resemble the kind of trail left by fuel from a jetliner. Earlier Vietnamese state media said the plane came down close to Vietnam’s Tho Chu Island, however these reports have not yet been confirmed by Malaysia Airlines who still describe the flight as "missing". At a press conference in Beijing, representatives from Malaysia Airlines said no wreckage has yet been found and they have deployed boats and helicopters in the area to verify reports from the Vietnamese Navy. The aircraft left Kuala Lumpur International Airport at 00:41 and was expected to land in Beijing at 06:30 local time (22:30 GMT). Despite local news reports, Vietnamese and Malaysian rescue crews have not located the plane’s signal, but Hanoi believes the craft disappeared in Vietnamese airspace. The flight was carrying 227 passengers, including two infants, and 12 crew members, the airline said in a statement. "Malaysia Airlines is currently working with the authorities who have activated their search and rescue team to locate the aircraft," the airline added. There were 14 nationalities represented among the 227 passengers, according to airline officials. Passengers include 153 Chinese, 38 Malaysians, seven Indonesians, seven Australians, five Indians, four Americans, and one Russian, among others. The last contact the plane had with air traffic controllers was 120 nautical miles off the east coast of the Malaysian town of Kota Bharu, the airline said on Saturday. The pilot of the flight was 53-year-old Malaysian national Captain Zaharie Ahmad Shah who has logged a total of 18,365 flying hours and has been working for Malaysian airlines since 1981. 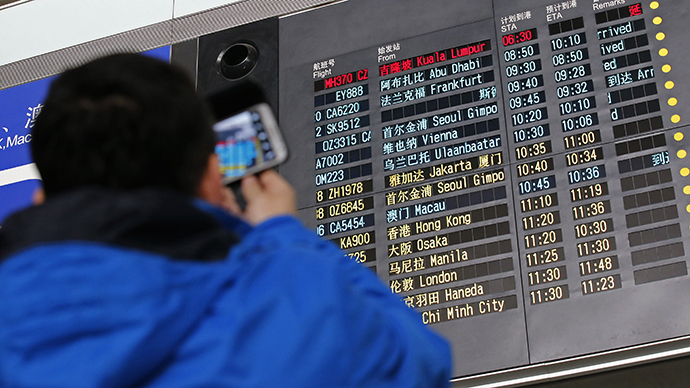 China is assisting Malaysia Airlines with the search for the plane, Chinese state television reported. "We are very worried after learning the news. We are trying to get in touch with relevant parties to check it out," Foreign Ministry spokesman Qin Gang said in statement. The flight was a codeshare with China Southern Airlines. Prior to July 2013's deadly crash of an Asiana Airlines 777 in San Francisco, the aircraft had been one of only a few long-range jets built by Boeing and Airbus to have never recorded a fatality. The 777 first flew in 1994, and was introduced into commercial service in 1995. Boeing had delivered 1,100 of the aircraft around the world as of last year. "We're closely monitoring reports on Malaysia flight MH370," Boeing tweeted. "Our thoughts are with everyone on board."